The kitchen is where all the action happens in the Clarke household – for good (my husband’s cooking) or bad (my cooking). It’s also the biggest energy user in the home. For these reasons, I have set myself the task of improving how I use this busy room – and I am going to drag my husband and two children along with me for the journey! I thought I would share some of my findings on energy waste in the kitchen with you guys and gals, so that you can make some simple but effective changes. This may seem like a strange one to begin with but it’s certainly significant – wasted food contributes towards carbon dioxide emissions. UK families are wasting 4.2 million tonnes of food and drink every year, so this is certainly ‘food for thought’ *chuckle* when looking to improve energy standards in the kitchen. Only cook what you need and always check what is in the house before shopping. Why are you boiling more water than you need? I regularly ask my husband this question, especially that time he filled it above the maximum level (! ), but I don’t receive any discernible answer. Three-quarters of Britain households overfill their kettles, wasting a total of £68m each year – which begs the question, why? Only boil the water you need in your kettle. I am not good at cooking and my husband is much better, but at least I am more economical with how I use energy. Cover pots and pans with a lid to speed up the boiling process; boil the water in the kettle and then pour it into the pan to use less energy; put only the amount of water you need in the pan; turn off the heat a couple of minutes before your food is cooked as cookers take a moment to cool down. These are just some of the things you can do to improve how you operate in the kitchen, but I’m afraid it won’t make your food taste any better if, like me, you don’t have the necessary skills. Another problem with my husband is that he ‘accidently’ leaves the fridge door ajar every now and then. This is wasting energy and so is leaving the door open for long periods of time when getting stuff from inside. Although you may not like it, defrosting every now and then will help keep your fridge at peak performance. Also, make sure that you don’t put hot food in the fridge as it will then need to work extra hard. Standby mode is not a friend of energy saving in any room of the home, least of all the kitchen where there is a multitude of appliances. If you are not using your microwave, dishwasher, washing machine or tumble dryer, turn them off at the plug. A dripping tap is basically money going down the drain, repeatedly. If it’s hot water then that means energy is being wasted too. The simple answer is to stop ignoring that annoying sound when you come home from work and get it fixed. I have got into the habit of using an airer to dry clothes as the dryer is one of the most power greedy appliances in the home – along with the washing machine. It may take half a day for the clothes to get dry, but this is a great way to save energy in the kitchen. Try to keep loads in the washing machine at 30 degrees too for some more big energy savings. Do you find yourself opening the oven door when cooking to see how the food is going? Ask yourself why you are even opening the door to see your food and I bet the answer will be, because it’s dirty. A simple clean of the oven door can give you big energy saving rewards and a wonderful view of your food cooking. 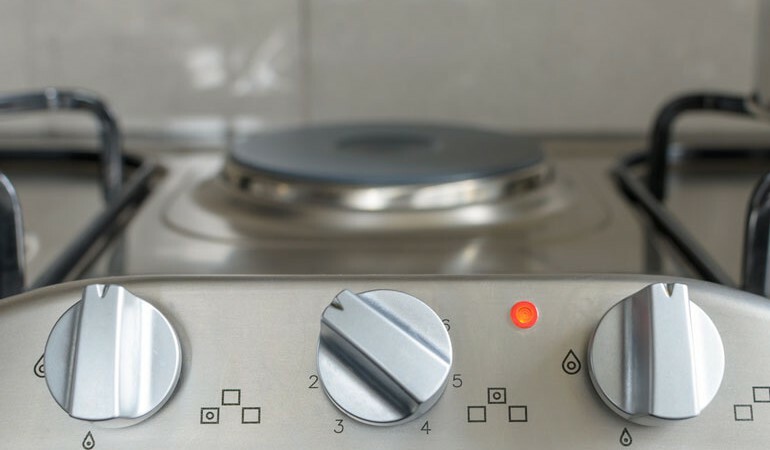 If it’s a small portion of food in need of heating then the microwave can be a good method of doing this – compared to the hob or oven. Also, use a lid to speed up cooking time and leave food to defrost overnight rather than microwaving it. Modern dishwashers are said to use less water than doing the job by hand, but that doesn’t mean you should waste energy by filling it half-way and turning it on. Always go with a full load and when it’s finished open the door to let the dishes air-dry. These are simple changes but they can make a big difference to your bills and energy waste in the home. If there are any others that would like to add to the list, please do let me know in the comments below. It would be a big help to me and others! I’ve also got more energy saving advice for you over at Find Energy Savings so please do say hello.